7 to 10 litre food caddy liners, 52 bags on a roll with tie handles. Compostable & biodegradable liners or bags for food waste caddies made from GM-free corn starch material and certified to BS EN 13432 and European seed logo. All liners are fully compostable and biodegradable. Compostable liners really are the easy and tidy way in which to collect food waste. Whether you are taking your fruit and vegetable peelings to your own compost bin or looking to deposit your food waste in the council collection scheme, the use of a biodegradable and compostable bag makes life simpler. Zero landfill with no harmful residue. 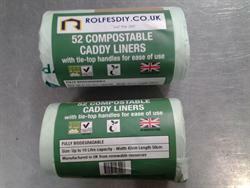 No related products for the Biodegradeable compostable food caddy waste bags. No key features selected for the Biodegradeable compostable food caddy waste bags. No quantity discount for the Biodegradeable compostable food caddy waste bags. Be the first to submit a review for the Biodegradeable compostable food caddy waste bags.